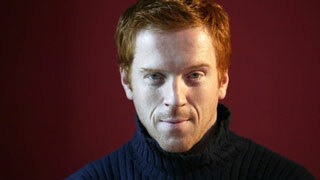 Damian Lewis: the next 007? Damian Lewis, who starred in Wolf Hall as King Henry VIII and as Soames in the remake of The Forsyte Saga, is currently top of the list to replace Daniel Craig as the next James Bond. Bookmakers in England recently made him a 3 to 1 favorite to win the role, moving up from 25 to 1. 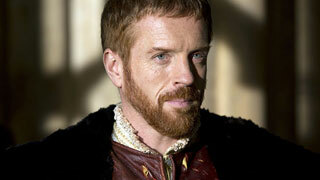 As King Henry VIII in Wolf Hall. The 43-year-old red head is currently appearing on stage in London’s West End, starring alongside John Goodman in American Buffalo, which runs until the end of June. In it, Lewis plays a 1970’s sideburned, purple suited schemer replete with a handlebar moustache which he grew especially for the role. Both Lewis and his moustache attracted a lot of attention recently at London’s Royal Ascot which the actor attended with his wife, actress Helen McCrory. 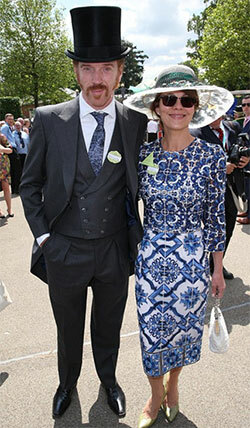 With wife Helen McCrory at Royal Ascot. It appears that Lewis is no stranger to mixing in Royal circles. His maternal grandfather was the Lord Mayor of London and he can count at least one Lord on his maternal grandmother’s side of the family. According to Lewis, the people he grew up with were “very much like Soames and in a milieu very much like the Forsytes”. As a young man he attended the prestigious boarding school Eton College, which was also where actors Eddie Redmayne, Dominic West and Hugh Laurie went to school. As did Princes William and Harry and last year the Duke of Cambridge had the honor of presenting Lewis with an OBE (Officer of the Order of the British Empire) for the actor’s services to drama. The ceremony took place at Buckingham Palace and was originally to have been presided over by Prince Charles. Lewis had no idea that he’d be receiving his honor from a fellow Old Etonian. Prince William and his wife Catherine are apparently big fans of Lewis’s award winning cable television series, Homeland. In Homeland, Lewis plays an American U.S. Marine Sergeant – his accent is flawless and was probably picked up on one of his many visits as a child to the U.S, where he spent his summers staying with relatives. Lewis’s ability to portray an American convincingly was first taken advantage of years ago, when Steven Spielberg, who had seen Lewis in a London production of Hamlet, cast him as a U.S. Army Major in the HBO miniseries, Band of Brothers. Although we’re more used nowadays to seeing Lewis on television, he started out as a stage actor with the Royal Shakespeare Company. Along with his wife and two children, Lewis divides his time between homes in London and Los Angeles.